Fishing is one of Australia’s favourite past times. Any keen angler will have a story of “the one that got away” and the saga about their “biggest catch”. To ensure that your next fishing story is even bigger and better, Motor Yacht Charters Sydney has launched Pisces – a luxury game fishing charter vessel. For fishing fanatics, Pisces presents the ultimate game fishing experience on Sydney Harbour. The equipment on Pisces is second to none; the rods have been crafted by one of the world’s top three master rod makers and the navigation equipment is state of the art and includes 3D GPS. There are also inbuilt cockpit video cameras to capture lasting memories of your catch of the day. Sydneysiders and visitors who are looking to try their hand at something new or are seeking a different way of taking in the iconic Sydney Harbour, will be just as impressed. Custom built by Riviera, Australia’s most awarded luxury boat manufacturer, Pisces is as stylish as they come. Fishing enthusiasts will find themselves inclined to retreat to the comfort of the sophisticated saloon with panoramic views where they can select from a contemporary menu as well as local and international wine. Those who are less experienced at the sport of game fishing will be learning from the best. Michael Tess, the skipper on board, is a champion game fisher with 35 years local and international experience. Pisces has capacity for up to 10 people, plus crew, for offshore game fishing. The vessel doubles as a unique function venue for those seeking a more intimate experience for up to 30 guests within Sydney Harbour. Overnight accommodation is available in two double cabins with ensuites. Groups can choose from a range of pick up points along Sydney Harbour including Sydney’s King Street Wharf. 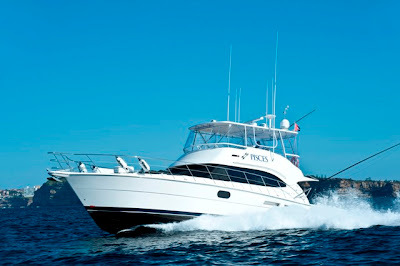 All inclusive game fishing charters for 10 people start from $5,500 for up to eight hours. Motor Yacht Charters Sydney, an Australian owned company, has a management team with over 30 years experience in the marine industry. Motor Yacht Charters Sydney operates two luxury motor yachts – Ariston and Pisces – on Sydney Harbour for private groups and corporate charters. Ariston has capacity for up to 60 guests for a stand up cocktail function. Pisces can accommodate up to 30 guests for an intimate function within the Harbour or 10 people for offshore game fishing.